Following on from the Big Ask Climate Change stall at Razorlight’s concert last year, Sheffield Friends of the Earth campaigners, Maureen, Shaun, Siobhan, Julie, Liddy and Steve asked Ash fans to sign about 150 postcards at their October 25th gig at the Octagon centre (University of Sheffield). The postcards ask MPs to make the climate change bill stronger than the current version. 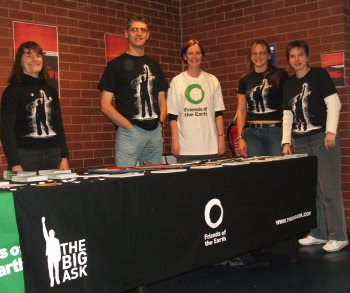 Besides Ash displaying two large FoE banners inside the Octagon, they are promoting the Big Ask on their web site and will be making a donation at the end of the tour.